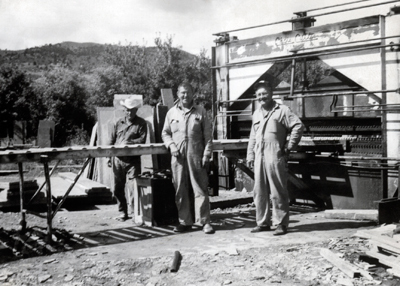 The Loukonen’s started in the stone business in 1890, with our great grandfather buying the quarries we presently still extract the best Colorado stone from. 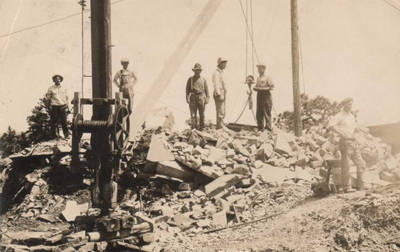 At the turn of the century (1900) there were 600 men working the quarries around Lyons, Colorado. At that time all of the stone that was removed was taken out and cut by hand, hammers, wedges, bars, and shovels. We have continued that tradition to the present day as this method of stone extraction provides the best quality natural stone product for landscaping and decorative stone applications. The only thing we do different now is the use of forklifts to move the material and the hydraulic cutters for cutting the stone to dimension. In 1951 Leonard and Reino Loukonen started the present stone yard. They employed, supported and helped many of the local stone company owners to start in the business. They are fondly remembered by many people because of their kindness and willingness to offer a helping hand to others in need. In 2000 the fourth generation of Loukonen’s (Leonard’s 6 children) purchased the company, with all of us involved in day to day operations. Since the early 1990′s the company has grown from two hydraulic cutters and four employees to six hydraulic cutters, a sawing and polishing operation.